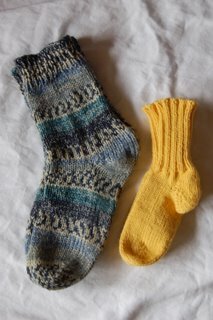 dancing socks, the yellow ones at least will be dancing socks as they are for the dancing princess, special request. She informed me on christmas day that she didn’t get socks for christmas and both Mummy and Daddy did! How could I resist, the yellow is her choice, I of course would never choose to knit something yellow. I am hoping her favourite colour changes sometime soon! The top blue socks had bad karma and I thought they were never going to be finished. 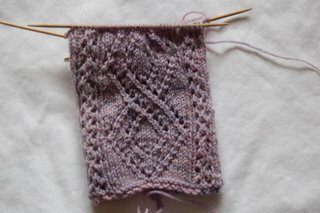 One of the kids on holiday snapped the wool to have a piece of wool to fish for mussels, I was worried about the join being noticeable but my Mum tried them at christmas and pronounced it fine. So finally they are done and I can start some new socks on my 2.5mm needles. I need to buy another set of bamboos in this size but have been unable to here, I don’t want to work with 8″ metal needles, so will have to order some online. The middle blue socks were a quick knit for Jordan who suddenly realised that he had no handknit socks, he does like them so a pair in finer wool is next on the cards. The lilac/pink sock is New England from Knitting on the Road, these are going to my friend Margaret, she needs some good wishes right now, so these pretty socks are going to be full of love as only handknit socks can be. But I do like the yellow ones, very sunny! It’s orange I have problems with…there’s no rhyme or reason for it. I’m glad to see the Denmark socks whole! We never even got a mussel dinner out of the sock severing episode. 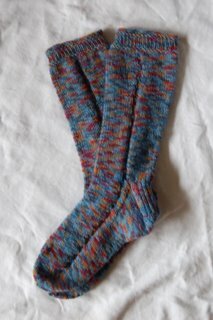 As I plug away on my sloooow sock (the first, I’m afraid, of a pair), I confess I am jealous! But impressed. Beautiful socks. Those last ones are going to be amazing. Oh, they’re all quite lovely. That last one — for your friend — is gorgeous. So nice. Yellow is forgiveable, even attractive on a little girl. Those lace socks are gorgeous! How very ambitious of you. Your yarn-snapping story reminds me of something my husband did when he was a child. He was “making something” and spied his mom’s knitting needles sticking out of her knitting bag. They were just what he needed so he yanked them out of the bag. Too bad he pulled them right out of a work in progress. I think he might have been closer to death that day than anytime since. His mom was not happy, to say the least!